Devkant Sangwan is an ardent lover of nature and is a passionate traveler. He belongs to Haryana (India) and is a law graduate by profession. He’s professionally well qualified and is an Associate member of the Institute of Company secretaries. Like many others, Devkant’s heart did not lie in his profession. He was born to follow his dream which is exploring the beauty of nature. He visited Valley of Flowers for the first time in 2004 and instantly fell in love with the splendor of the place. He started pursuing the place more often and adored it over and over again. He even left his job for his travel pursuits and calls the place as his second wife. Juncus himalensis is a perennial herb up to 70 cm height with short rhizomes. Stems are terete and leaves are cylindrical and hollow. Flowers are two or few in dark brown, shiny clusters. 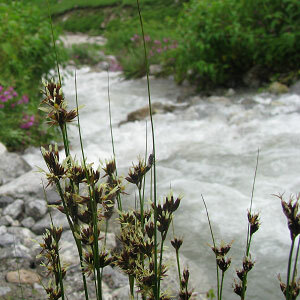 The specific name himalensis refers to plant's habitat in Himalayan region.